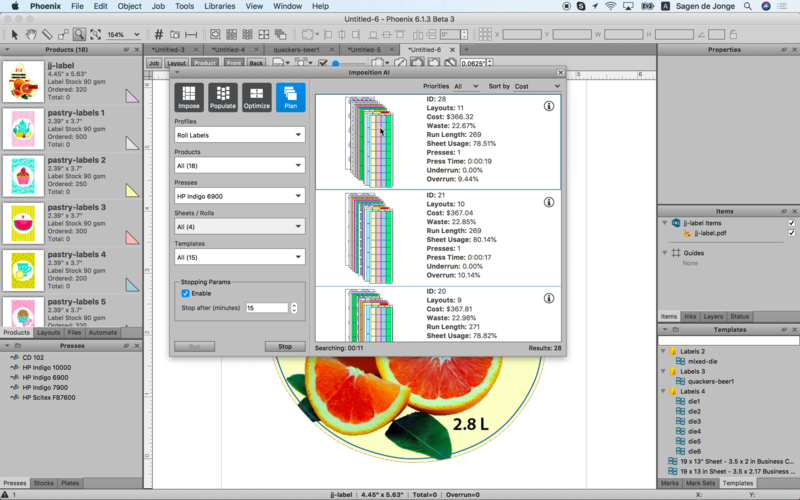 At Labelexpo Americas 2018 in Chicago from 25 – 27 September, Tilia Labs, a leading developer of planning, imposition, and automation software solutions for the graphic arts industries, will be unveiling the power of its forthcoming Phoenix 7.0 software release for narrow web production. For the first time in the US, Stand 6461 will showcase brand new features for optimizing substrate usage and boosting setup speed, flexibility and control for narrow-web label printers. tilia Phoenix uses Artificial Intelligence (AI) in automating planning and imposition for all types of print and post-press applications. The system factors in parameters, such as job specifications (quantity, dimensions, colors, substrates), presses/print devices, postpress requirements, and delivery considerations, to deliver optimal layout options. When a final option has been selected, tilia Phoenix generates print-ready layouts and JDF or die instructions, for all devices in the production chain. Among highlights being previewed at Labelexpo are new developments in narrow-web planning, standing die support and marks control. Optimized lane-based planning – automatically and dynamically computing millions of layout options, Phoenix 7.0 delivers combinations for reducing substrate consumption in minutes, including combining items of differing sizes and shapes in the same lane. Custom grouping rules – Phoenix 7.0 adds custom properties and grouping rules to give users greater flexibility to set combination preferences for lanes and standing dies. Lead-in and lead-outs – Specify required lead-in and lead-out for each label to be planned and apply dynamic marks such as barcodes, and eye marks. The new tilia Phoenix version 7.0 will also incorporate significant performance enhancements to the Imposition AI engine which forms the power core of the Phoenix solution. Data processing capable of keeping up with the fastest presses on the market complements recent improvements to template-based planning and optimizations for sheets and rolls. These enhancements push the speed boundary yet further for Phoenix in searching across millions of combinations to find the most cost-effective layouts within a matter of just minutes. Major estimating and reporting enhancements also allow for better analysis, accountability and future planning, including press-time granularity down to the nearest second.